The whale shark (Rhincodon typus) is the world’s largest living shark and largest living fish. Adult specimens measure up to 13 metres in length, though accounts of individuals of up to 18 metres have been recorded. The shark is among the latest maturing and longest lived of all fish, reaching sexual maturity at around 30 years of age and reaching ages of up to 70 to 100 years old. It is among three species of large filter feeding sharks, the other two being the basking shark (Cetorhinus maximus) and the megamouth shark (Megachasma pelagios), and is characterized by its broad, flat head and large, terminal mouth. 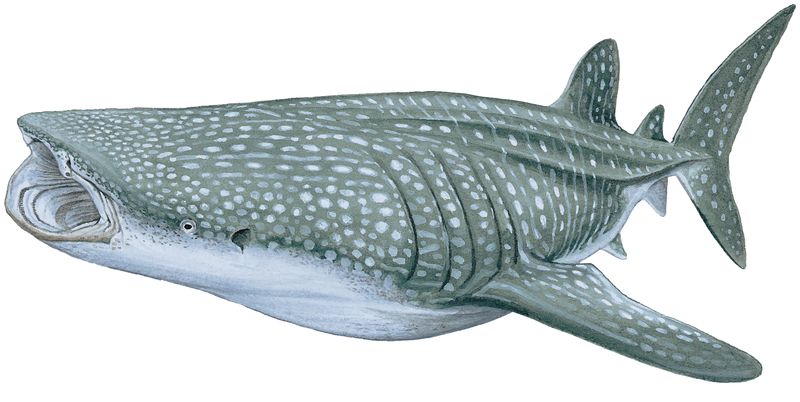 It is easily distinguishable from other sharks by its enormous size, unique ‘checkerboard’ pattern of spots and stripes on its back, three prominent longitudinal ridges along its upper flanks, and its characteristic head and mouth. First described in 1828 by Dr Andrew Smith off the coast of South Africa, the whale shark occupies a circumglobal distribution, occurring in all tropical, subtropical and warm temperate seas (apart from the Mediterranean) between 30°N and 35°S. It is a pelagic and highly migratory species; recent studies have shown that individuals undertake multi-annual and very long distance migrations of up to 13,000km, with records of individuals travelling on such extensive journeys as from Mexico to Tonga and from east Africa to Thailand. It is believed that its movements follow closely to local productivity fluctuations, specifically to plankton blooms and spawning events. The biology of the whale shark is still poorly understood. No specimens between 93cm and 3 meters have been recorded in the wild, and it was only recently in 1996 that they were found to be aplacental viviparous when a female was captured pregnant with live young. No breeding, mating or pupping behaviour has ever been observed or recorded in whale sharks. As filter feeder, the whale shark’s prey consists predominantly of small planktonic and nektonic animals such as invertebrate larvae, fish spawn, krill, copepods and small fish, but also occasionally includes larger prey such as small tuna, albacore and squid. Unlike other filter feeding sharks, the whale shark utilizes an active suction filter feeding mechanism, and is observed to actively pursue prey. As a result of the high value it commends in international trade (for its oil, meat, and fins), its slow maturation rate, low abundance, highly migratory nature and unknown breeding behaviour, the whale shark is considered extremely vulnerable to commercial fishing, and is given a Vulnerable status by the IUCN Red List authority. They have been officially prohibited from being fished, sold and traded in the Philippines and India, but continue to be hunted in these countries and other parts of Asia for their meat and fins. Dive tourism involving this species is a developing trend in several areas and has demonstrated that whale sharks can be far more valuable alive than fished, though there have been concerns with this practice, too. The whale shark is currently listed on Appendix II of CITES, Annex I of UNCLOS, Annex I of the CMS Sharks MOU and Appendix II of CMS.